Yorkville Creperie is exactly halfway between my friend’s apartment and mine, so it made a great meeting spot for Sunday brunch. Added to the fact that I recently bought a “Pay $10 for $20 worth of food” coupon, it was the obvious choice. It’s a cute little place, and although it was fairly busy, we were seated right away. The waitress took our order, but wasn’t particularly welcoming or friendly- and maybe even slightly put off. 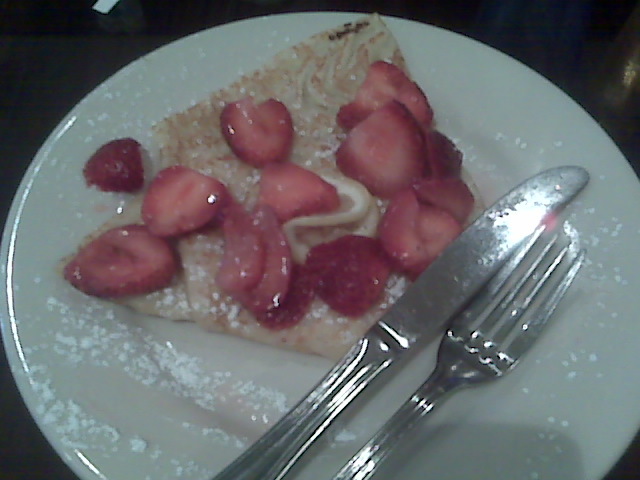 She did, however, agree to combine 2 crepe descriptions with no problem to let me order what I really wanted. The menu was pretty simple, but had plenty to choose from. There were salads and panini that also appealed, but to go to a crepe place and not order crepes would just be silly. I choice strawberry/lemon/confectioner sugar and was pleased. Light and fresh, nice consistency, with just the right amount of sugar sprinkled on top. My friend also enjoyed his crepes with berries and whipped cream. We both cleaned our plates and left feeling comfortably satisfied, not overstuffed, as is often the case with the crepe’s heavier cousin the pancake. I will plan to go back again when I want a special treat- the nutella and chocolate filled crepes sounded great and the other dishes that we saw on our neighboring table looked tasty. It’s not like it’s the most incredible food around, but super convenient and very fairly priced. Glad I finally tried it!